The delphinium has been a very popular cottage garden perennial for over a century, having been brought to the UK from France in 1859. It is grown for its tall spikes of colourful flowers that create prominent towers in all shades of pink, mauve, blue and white. It is particularly useful for providing a vertical focal point at the back of a mixed herbaceous border through June and July. The name is said to be from the Greek for dolphin, because the shape of the bloom and each individual flower nectary was considered to resemble the creature. In the garden, the flowers are attractive to pollinators such as bees and butterflies, while indoors they make a stately centrepiece to a summer cut flower arrangement. There are approximately 300 species in the genus, mostly from upland areas such as the Alps, though most of the modern cultivars come from a relatively few species, most notably Delphinium elatum. The ‘Pacific Giant’ hybrid delphiniums, developed in the United States, are very popular in garden centres, and can be recognised from their single-colour cultivar names, including the archetypal blues. They typically grow up to 1.8 m tall and need room in the border to spread to 1m in diameter. The ‘Millennium’ delphinium hybrids are a second popular group. They were originally hybridised with D. cardinal in New Zealand, and they come in shades of red, orange, and pink. Some care needs to be taken with positioning in gardens used by children, as delphiniums are harmful if eaten and they cause a skin rash in some people. The following are generally widely available as young plants in 5cm modules or 9cm pots from January through to March. Tall cottage garden spikes covered in beautiful dark violet flowers with black centres. Masses of pure white flowers clustered tightly around the upright spikes that look luminous in the border, especially around sunset. This elegant perennial often produces a second flush of flowers later in the summer if the first flush of flowers are removed promptly. It makes a wonderful cut flower. This beautiful variety grows up to 1.8m tall and has spectacular pink petals that contrast with a black eye. Often an early flowerer in May to June, though will come again later in the summer if the first flowers are cut back as they fade. This is a cultivar from the very hardy Highlander series, originating from Glasgow, and has double, dusky-pink, ruffled flowers that are excellent for cutting. ‘Blue Bird’ has majestic, tall flowering spikes that are laden with vibrant, clear blue blooms from June to July. This is an elegant Pacific hybrid with an old-fashioned appearance thanks to its mound forming habit, distinctively cut, grey-green leaves, and pure blue flowers. It is perhaps the most typical of the delphinium varieties, and looks splendid in bold drifts at the back of a mixed or herbaceous border. This stunning white cultivar has branching stems that support towering spires of pure white flowers that look like church candles arising from dense mounds of rich green foliage. ‘Princess Caroline’ has spectacular deep salmon-pink flowers with traces of red. It is one of the smaller varieties at 1.2m tall, and was first exhibited at the Chelsea Flower Show in 1994. This variety has powder-blue flowers, each with a white eye, evenly spaced along the stout flower spikes, creating towering rich-blue columns in July. The Chinese delphinium has solitary flowers of an incredibly intense blue. It is much smaller than the delphinium hybrids, though it will repeat-flower throughout the summer if it is repeatedly dead-headed or cut for the vase. Delphiniums are also available as seed, generally labelled as Delphinium hybridum. Seed is very rarely available for the double-flowered varieties. To give your plants the best chance of looking like the picture on the packet, they should be bought from a reputable specialist nursery. Even then, a few unusual results can be expected! Delphinium ‘Amadeus’: purply-blue flowers with a dark eye. Delphinium ‘Blue Lagoon’: frilly pale blue petals with a conspicuous white eye. Delphinium ‘Cherub’: usually germinate into mixed pinks and pale blues. Delphinium ‘Christine Harbutt’: mostly whites, though expect a few surprises. For best results, choose an open and sunny spot in the border, away from taller plants, giving plenty of space and ventilation, though delphiniums should be sheltered from any cold winds. Delphiniums will need to be staked with bamboo canes, brushwood or decorative herbaceous plant supports as they start to shoot upwards in May. The ground around them should be kept well watered. They will bloom in June and July, and if left unattended, that will be the end of the display. However, if you cut the flower stem back as soon as the final few flowers on the spike start to fade, it is generally possible to encourage a second round of flowers in late August, especially if the plant is kept well watered and given a high potash feed. Delphiniums thrive in full sun, and will not flower so well in shadier conditions. The soil around delphiniums should never be allowed to dry completely as they are quite thirsty plants. Keep the ground moist though not waterlogged, and this will also help to reduce the possibility of mildew. Any fertile, well-drained garden soil will support good delphinium growth. They do best in soils that have had organic material incorporated on a regular basis. At their best, delphiniums are very heavy feeders and require a lot of nutrients. At the start of the season, mulch the ground with well rotted manure or good garden compost to help keep them nourished through the flowering season, and then again after they have been cut back in the late summer. A dusting of blood, fish and bone is also beneficial in spring, and for the best flowering apply a balanced liquid fertiliser every two to three weeks during June and July. 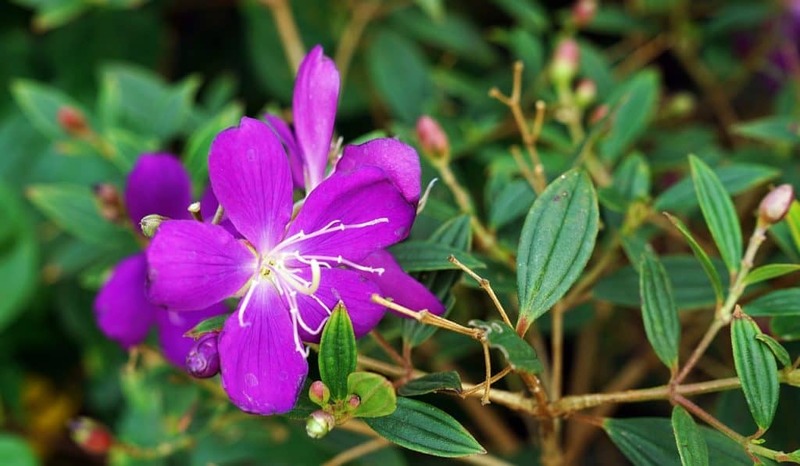 Most varieties will repeat flower if the initial flower-stems are cut back to a side-shoot as their final flowers start to look a little tired. Other than that, the only attention that will be necessary is to cut the stems back to the ground each August once flowering has completely finished. Delphinium cuttings can be taken from plants growing in the garden in late March and early April once the young growth has reached approximately 8cm. For earlier cuttings, it is possible to lift young plants from the garden in January and to pot them up into a moist general purpose compost. Keeping them in a light, warm place at around 15°C will force them into early growth and give suitable cutting material within a couple of weeks. For the best chances of success with the cuttings, choose firm, white shoots and remove them from as close to the crown as possible using a sterilised knife. Wash off any soil, and remove all but the top leaf. Dip into a suitable fungicide, and plant them around the edge of a 12.5cm pot half-filled with perlite. Place these pots in a tray of water, and keep them in a bright but not sunny position at around 15°C. Forced January cuttings should take about six weeks to root, those taken from the garden in March around a month or less. Once roots appear, transfer the cuttings into 9cm pots of John Innes No.2 compost with 10% perlite, and water infrequently only when the compost is fully dry to the touch. Harden off before planting out into the garden in May. Delphinium seed can be sown into trays in late January. Sprinkle evenly over the surface of a proprietary seed compost, cover the tray with black plastic and maintain at around 15°C. Germination should occur within ten days, and then the plastic should be removed and the germinating seed covered with a thin layer of fine vermiculite. Once the seedlings are large enough to handle they should be pricked off individually into 9cm pots. The plants should be hardened off gradually before planting out in May. Delphinium plants can also be divided to create new plants for the garden, though this has a greater risk of harbouring disease than propagation by cuttings. Lift clumps from the border in March or April and carefully wash off any soil to help expose and remove any rot, which should be disposed of. Divide the clump with downward cuts using a sterilised, sharp knife, and replant. The fresh luxuriant growth of delphiniums is unfortunately susceptible to a wide range of pests and diseases, and plants should be carefully monitored for damage and deformity. Unless a garden has extremely efficient natural slug and snail control, it will be necessary to take measures to protect the young foliage of delphinium plants against attack. The problem tends to be greatest earlier in the year when the foliage is more tender and closer to the ground, and more mature plants can generally withstand routine slug attention. Pellets are effective but neither organic nor wildlife-friendly, so many gardeners prefer to use a nematode control wash each autumn, or their favourite home-made deterrent such as a garlic drench. This can be made by adding crushed garlic cloves to boiling water and simmering for half an hour. The drench can be kept in a bottle in a dark place and used once a week at the rate of a tablespoon in five litres of water. Red spider mite, leaf mining larvae and the caterpillars of various moths and sawflies can also be responsible for damaged foliage. These can be sprayed, or the visible caterpillars and damaged leaves regularly picked off and disposed of. Leafhoppers can also cause problems by spreading diseases from plant to plant. Root rot and crown rot can affect established plants, especially as they age. Badly affected plants will rapidly become less vigorous and should be disposed of to be replaced by fresh plants. Delphiniums are particularly prone to powdery mildew, especially if they are allowed to dry out in the summer, though the affected plants generally recover. For mildew-prone gardens and borders, make sure that subsequent plants are set out with more room and air circulation, and thin out the shoots as they emerge from the crowns early in the spring. Always keep the plants well watered during the growing season. Many of the purple varieties seem particularly prone to mildew, so avoid these. Stunted or deformed plants may be suffering from a viral infection, and affected plants should be removed and destroyed to contain the problem. Q I am trying to restore a traditional cottage garden and love the deep blue delphiniums. What should I plant to complement them? There is a huge range of traditional and more contemporary plants that can be used in mixed and herbaceous cottage garden designs. The old fashioned foxgloves, shrub roses, lupins, paeonies, phlox, penstemons and irises all work well with delphiniums. The bold hairy leaves and towering yellow spikes of verbascums are also good companions. A few well-chosen shrubs can add interest and texture through the year. Though they are less traditional, try panicled or oak-leaved hydrangeas and the smaller, variegated spindles. For a more contemporary feel, use delphiniums with large drifts of echinaceas, rudbeckias and verbena, or plant them alongside eryngiums for a real contrast of texture and foliage colour. To have a succession of your favourite delphiniums throughout June and July, make sure you plant a range of varieties and include some of the earlier and later flowering cultivars. Q Every year my delphiniums go floppy and look untidy. Should I water them more, or am I doing something else wrong? Your problem is not unusual. Delphiniums are naturally top-heavy plants and they nearly always need support once they reach 30cm or so in height. Staking can be done with tall, purpose-made, semi-circular metal plant hoops, bamboo canes and string, or twiggy brush-cuttings from hazel or a similar bush – rather like pea sticks. The individual stems do not need to be tied in, they should just be physically supported by the chosen framework. Whatever system is used, the tall flowering stems should be allowed to flex with the breeze and it is important that air can still circulate around and through the plant to minimise the risk of fungal disease. If you dislike the look of stakes and supports, grow delphiniums unobtrusively behind tall hardy geraniums or bushy roses so that only the top of the plant and the flower spike emerges into view during the critical flowering period. Q I am worried that delphiniums are poisonous. Now that I have grandchildren visiting I am considering removing them from my garden. While delphiniums are closely related to the very poisonous aconite, and they do contain some poisons, the danger is really quite theoretical as there is little about the plant to encourage anybody to eat it. 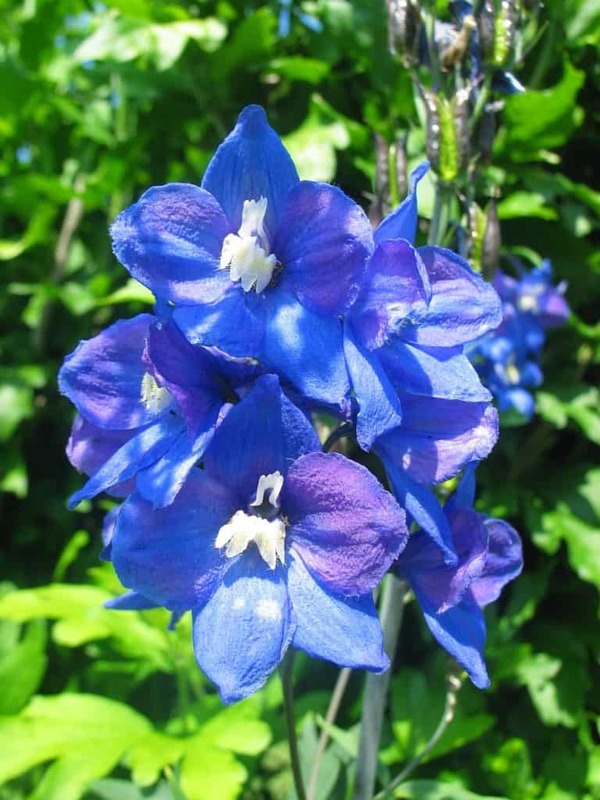 The Horticultural Trades Association has produced a Code of Practice for potentially harmful plants, and this lists delphiniums as category C, the lowest hazard rating. The Code suggests that these plants are perfectly safe to purchase as long as any warnings are heeded, but that they should not be planted where small children are likely to have access to brush against or eat them. There have been no known documented cases of serious delphinium poisoning in the UK, though it has been responsible for the poisoning of cattle and other farm animals in the United States, where some species are found growing naturally in mountain pastureland.